Where? 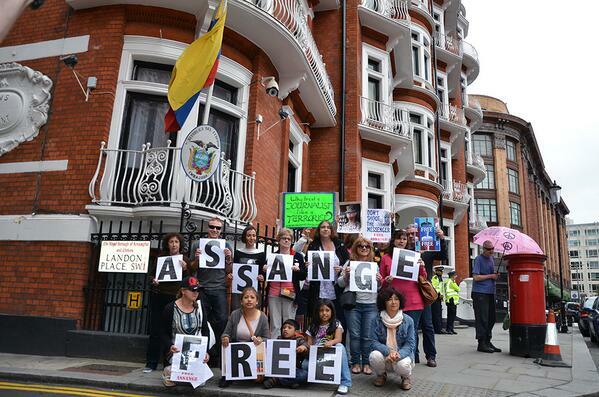 Outside the Ecuadorian Embassy, 3 Hans Crescent, Knightsbridge, London SW1X 0LS (next to Harrods). Folks from London Catholic Worker & South London Massive invite you to join us outside the Ecuadorian embassy. Bring food, drink, instrument & a song to share! We will stay until 5pm, others may stay or gather later. A daily solidarity vigil continues outside the embassy 4pm-6pm. Where? US Embassy, Grosvenor Square, London W1A 2LQ. Our next monthly demonstration neatly falls on US Independence Day. To celebrate our “dependence” on the US, the LGC is changing the time of its demonstration to 6pm and will be holding an open mic and inviting other organisations to join us and speak out against the increasing subservience to the US and its skewered policies on just about everything. The past year has seen a particular deterioration with the extradition of British nationals to the US in October last year under a lopsided extradition treaty, resulting in their torture in pre-trial solitary confinement, the current trial of US/UK national Bradley Manning and the latest leaks via the NSA of the collusion between UK and US intelligence to spy on YOU. Please join us. As with all our protests, this is NOT an anti-US demonstration but an opportunity to raise issues of vital importance to both US and UK interest. The other reason for the change of time is to support another action by the Save Shaker Aamer Campaign in the afternoon in Parliament Square, where they will be holding their own “Independence Day” action as part of the ongoing action for Shaker Aamer. If you’re not in London, please consider the main UK event organised by CAAB up at Menwith Hill, North Yorkshire. More information below. The court martial of Bradley Manning continues at Ft. Meade (NSA HQ) Maryland, USA. Solidarity actions continue at Ft. Meade & around the world. 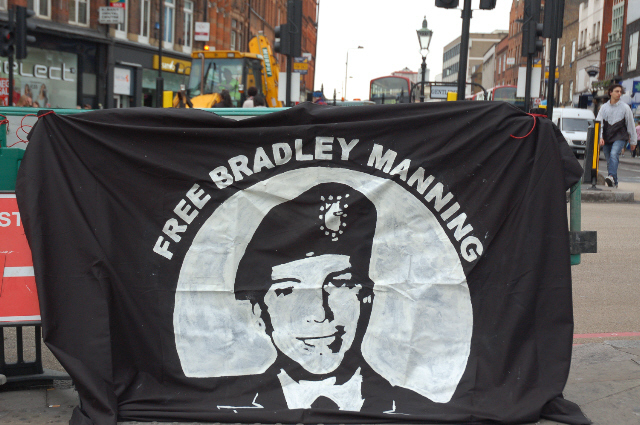 See reports on wiseupaction.info and bradleymanning.org. 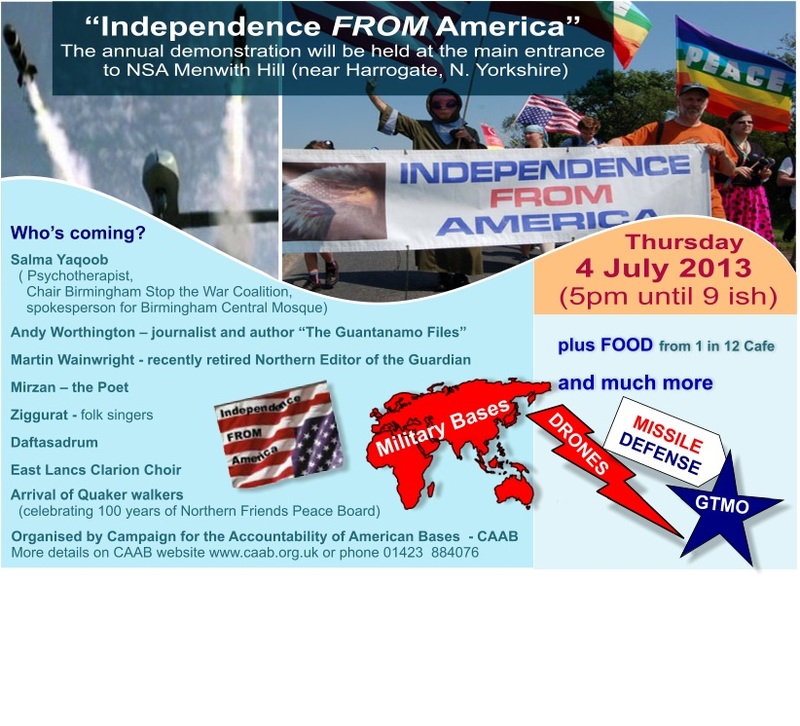 Organised by Campaign for the Accountability of American Bases, you can show your support from Bradley Manning, Edward Snowden and all whistleblowers at their annual Independence from America demonstration. More information: 01423 884 076 or 07949 897 904 or see this indymedia article. 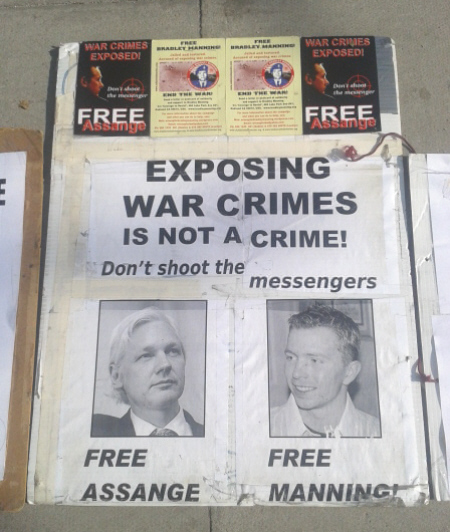 Gallery | This entry was posted in Announcements, Assange, Manning. Bookmark the permalink.